I agree that the major reason the NRA is able to help elect politicians that have 'good' NRA ratings is because pro-gun voters tend to be single issues voters. This is especially true in the GOP primaries. Having a 'poor' NRA rating in many districts\states is a death sign. In addition the NRA will donate money to the GOP candidate in the primary with the bests NRA rating. That being the case, with all the media coverage of gun violence and what appears to be majority support of additional gun-control laws at the federal level, one would think that his would lead to more single-issue pro-gun-control voters. If not, change will not occur. As for your 'one vote doesn't make a difference' nonsense: how many others are their like you? It appears thousands, if not millions, which is one of the reasons Trump is President. few and far between compared to single issue anti gun regulation voters. Dana Loesch is quickly becoming one of the most repugnant figures on the far right, rivaling Coulter and Hannity. But the legislation actually isn’t that unusual, as 34 other states have no minimum hunting age. 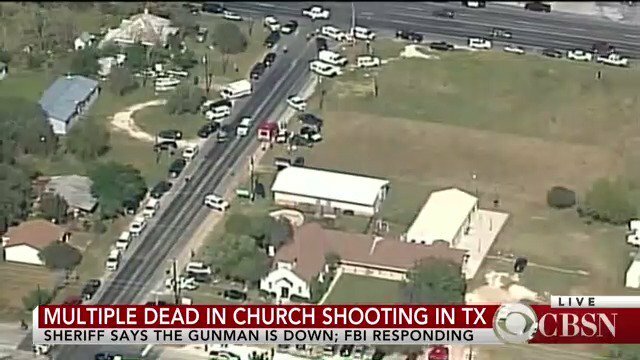 The shooter turned his gun on people -- kids -- in a place of worship. America is in the grips of a gun violence crisis. Congress must act. Latest report indicates 27 dead and 20 wounded per Washington Post. Neither Congress nor the states will do anything. I live in a country that has pretty strict gun control. No handguns or assault weapons are allowed up here. But I've always said that if I lived in the U.S., I'd own a handgun for sure. Probably a couple. Bag this sucker all by myself! Looks like a little psycho. Like a Chucky doll in camo. Don't bother us West Virginians a bit. "A law isn't going to stop a bad guy from getting a gun"
"Let’s start with an undeniable truth: In the United States, the people have the right to keep and bear arms. 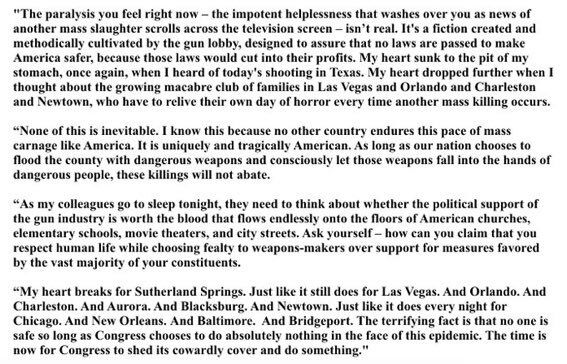 And let’s then acknowledge that the childish interpretation of that constitutional amendment—that Americans have the right to whatever accessory they can put on, in or over a gun for the sole purpose of making it more deadly—is a dangerous falsehood. Ban accessories that serve no purpose other than to transform guns into weapons of mass slaughter, such as attachable drums that carry 100 rounds. Adopt rules that make it harder for criminals and the mentally ill to obtain firearms. Outlaw the public display of weapons. Allow the concealed carry of guns using the “shall issue” standard. Stop trying to ban scary-looking add-ons that primarily protect the shooter, but don’t make the gun more dangerous to others. Abandon efforts to outlaw “assault weapons”—a politically loaded phrase with a mishmash of meanings that pretty much amount to nothing. I'd like to see the tourism figures from those from abroad this year. And just to think when I was that age I was in a movie theater crying over the death of Bambi's mother. The influence of the NRA has certainly changed America since my childhood. will either shoot themselves or one another. What a crock. There were more folks against gun control back when you were crying over the death of Bambi's mother than today. The NRA didn't create the pro-gun voter. Instead the pro-gun voter created the NRA! But it's interesting that you should say that--there's been a lot of hunting "accidents" around here lately, especially involving teenagers. That movie is what started this "humanization" of animals. Sent the wrong message in a big way of how nature works (a crying deer - really? ) which in itself can be cruel (by our standards). About hunting deer with fawns. By the way, if a baby bird falls out of it's nest, do the other forest creatures comes to it's rescue or cry for it? What's your point, that humans should act like forest creatures? My point is forest creatures don't act like humans.